1786 Connecticut Copper. Miller 5.3-B.2, W-2565. Rarity-7+. Mailed Bust Left, Hercules Head. AU-50 (PCGS).A superb and truly exceptional piece considering the great rarity of this variety and the relatively modern discovery of this specimen. It is far more often the case that latecomers to the rosters of rarities are low grade, but this is arguably the second finest of just four known specimens, and stands as a landmark coin in the extensive series of Connecticut coppers. 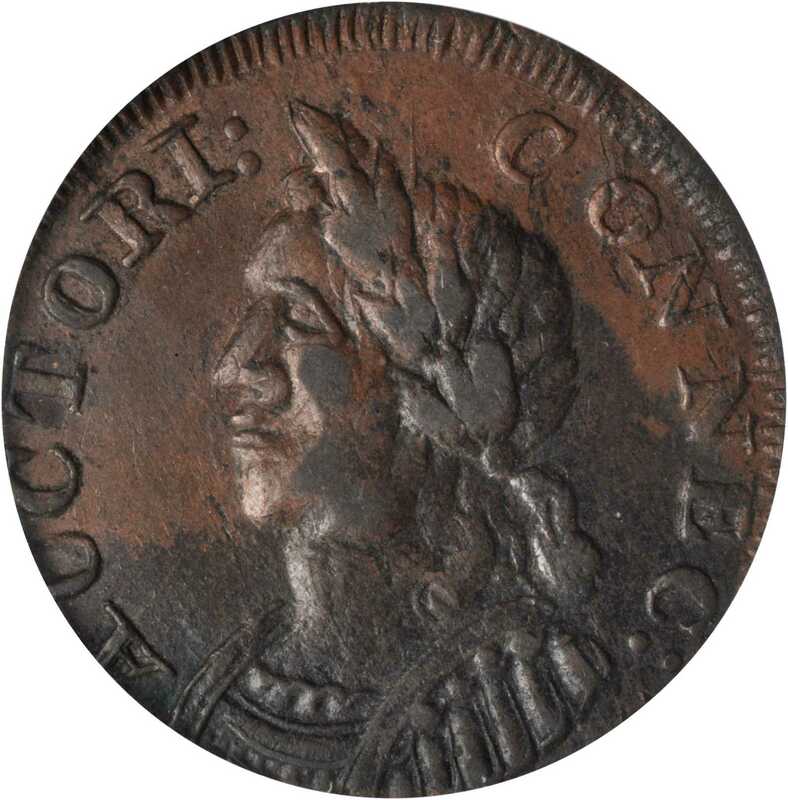 The obverse is uniform medium brown through the face and from the lower left field, upward around the head, through CONN. Toward the lower right the patina is deeper steel brown with extremely light granularity from mild corrosion evident upon magnification. The overall appearance is glossy and pleasing. Three or four shallow laminations are noted on this side, none of which stands out as a distraction. Centered a bit low, with the truncation and tips of AU of AUCTORI against the border. Around the top, long, pointed dentils are well defined. Likewise, the central definition is quite sharp. The reverse is very similar in appearance, though the medium brown tone is more consistent and only slightly mottled, with light surface roughness around the right side. The reverse die is sunken and distorted, as is the case on all seen. The four known, in descending order of condition are:p1. John J. Ford, Jr. Collection, Part IX:256. Called “Uncirculated” but with notable planchet flaws on both sides. This was the Henry Miller coin and is considered the finest overall.p2. The present specimen. From Heritage’s sale of April 2010:2005, which was its first known public offering and the sale that first brought it to light.p3. Garrett Collection, Part III, October 1980:1345. Called “AU” in 1980, and similar to this coin, but with marginally less detail.p4. George C. Perkins, January 2000:228. Called “VF,” with the reverse much weaker than on the other three. This was the Pine Tree 1975 coin, ex Q. David Bowers.pAs is evident from the listing above, only the greatest collections have included an example of this prize. It was missing from both the Frederick Taylor and Eric Newman holdings, and was unknown to Thomas Hall. When the Miller coins sold in 1920, the example of this variety included therein brought the highest price of any Connecticut in the sale.pWhile the Miller-Boyd-Ford coin is considered the finest known, the planchet flaws must be entered into any consideration of overall desirability. Still, that piece sold for $80,500 in 2005. When the currently offered example first appeared in 2010, it brought just a hair more than Ford’s at $86,250, suggesting serious collectors strongly desire the finest Connecticut rarities. That landscape is ever in flux as collectors come and go, but a truly great coin rarely disappoints as years can pass between offerings and astute collectors know to take advantage of rare opportunities when they present themselves.From the Twin Leaf Collection of Connecticut & Massachusetts Coppers. Earlier ex Heritage, April 2010:2005.